When I develop online communication strategy for the client (as well as any other strategy development), I like to consult the available frameworks, worksheets, guidelines, or any other strategy document templates. 1. Useless articles and other documents (mainly promotional ones with a “hidden knowledge”). Many people miss the difference between a strategy development and a tactics deployment. 3. The documents/articles which can be directly consulted/used for the development of a particular strategy. 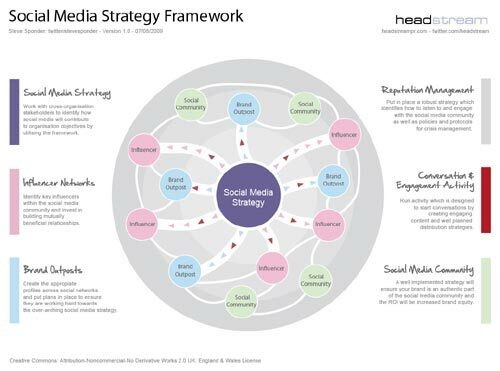 As I did the social media frameworks analysis two years ago, I went through several dozens of online documents/articles, to try to find a different views of the particular development of a social media strategy. 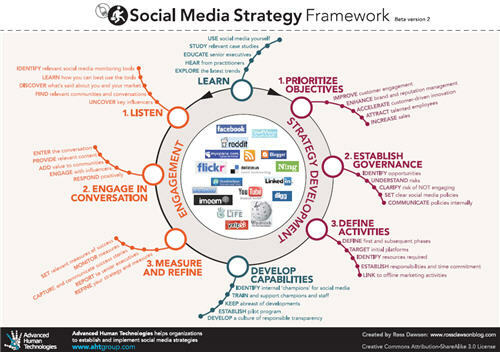 I like the frameworks approach for the development of social media strategy, if those frameworks really present the systemic “path” through the “web of possibilities” how to do a particular strategy. I like the applicable methods and detailed explanations related to the strategy development. I recommend one method and three detailed documents related to the development of the social media strategy. The POST method developed by Forrester (People, Objectives, Strategy, Technology) is the base of their very popular book Groundswell. 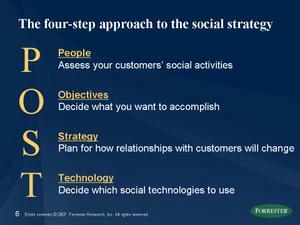 This method can be very applicable if Forrester’s Consumer Profile Tool is used for the development of the social media strategy (related to the consumers profile definition). 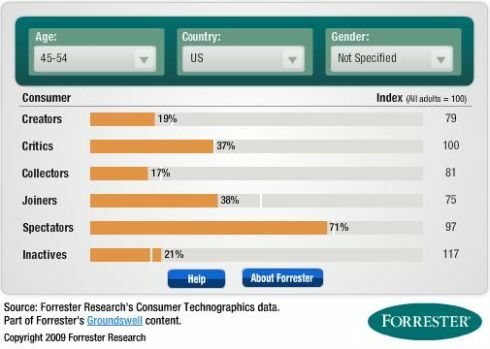 The consumer profile tool uses the categories of the consumer, as provided by Forrester’s Social Technographics Ladder : Creators, Critics, Collectors, Joiners, Spectators, Inactives. Additionally, you can use “New Media Strategy Map Worksheet” as the template for the implementation of this strategy approach. A big recommendation from me! I have been chosen three social media strategy templates in the form of the structured questions, and two templates in the form of table. Those templates are ready to be used immediately, if they suites the needs of an organization. This is the only paid document reffered (from Econsultancy) in this article, but in my opinion it is one of the best documents I have seen about the subject of social media (and online PR) strategy. The document is structured in the form of questions, and it has all the elements (including the adequate worksheets) to work on strategy through this particular template. 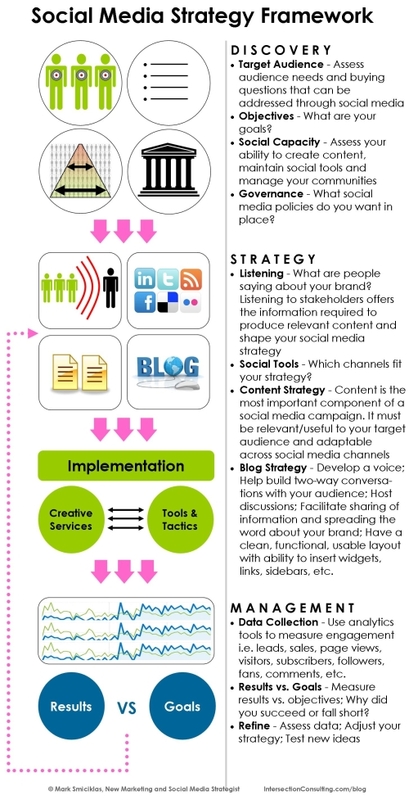 This pdf document provided by WeAreMedia.org is based on the mentioned strategy framework described by Beth Kanter. Although this template is meant to be the guideline for outsourcing the social media activities, it is very informative for the development of social media strategy, in a form of the questions asked in this template. You can learn more about social media strategy development from Social Media Strategy Worksheet Example – Illinois Arts Alliance and Admiral Mullenâ€™s Social Media Strategy. In addition, it is very informative to read very detailed Corporate Twitter strategy by Neil Williams. If you have a need for the development of social media policy, here is the database of more than 100 examples of social media policies.